Is the Tru-Pull® Advanced System Right for me? An ideal solution if you need moderate to maximum support for patellofemoral malalignment, subluxation and dislocations. Try our Brace Advisor for personalized product recommendations to meet your needs! Ultimate Support And Help with Relief From The Pain Of Patellofemoral Dislocations! The patented Tru-Pull Advanced System is designed to place a dynamic pull on the patella during knee extension to normalize tracking in the intracondylar groove and help reduce anterior pain. An ideal solution for a person who needs ultimate support for patellofemoral malalignment, subluxation and dislocations. Available with aluminum hinges for additional medial/lateral support and control of knee hyperextension. Independent anchors prevent rotation of the brace and provide a "True" and consistent pull on the patella to avoid lateral subluxation. The elastomeric pull device, with pull straps above and below the patella, has a rubber band type effect providing a strong dynamic pull on the patella as the knee extends. Breathable material makes the brace light and comfortable. Aluminum Polycentric Hinge Technology offers additional medial/lateral support and control of knee hyperextension. Designed so it's easy to put on and take off. Choice of 1/4" and 3/8" buttresses to give you the leverage you require. Looking for a brace for my son. His right kneecap dislocates to the outside of his leg. The tru-pull advanced looks like a much better brace than what he is currently using. He is a large brace just want to make sure we get the correct style for his dislocation. Yes, this will help with the tracking issues he is having. We would suggest selecting the hinged option to provide better support and stability. My right patella dislocates but it dislocates to the inside...which option of the True-Pull Advance System should I purchase? You would need to purchase a left to wear on your right to help with medial patella instability for your right knee. Hello... I have been diagnosed with misalignment of my right knee. I was given a tru pull lite by my ortho surgeon today. I really like the brace and felt improvement. However, this is only a temporary fix until I have a partial or full knee replacement. I more partial to full braces. With this said, Will the tru pull advanced work for me. I need the support to push my kneecap inward like the lite version. Lastly, what are the differences between the two braces. Yes, the Tru-Pull Advanced System is the more in-depth version of the Tru-Pull Lite which your surgeon gave you. The Tru-Pull Advanced System will also help prevent subluxation of the patella. The braces both perform the same basic functions but the Advanced System is a bit more supportive and secure since it covers more area of the leg. I have chondromalacia and patella tracking issues where my patella moves laterally. Activity usually results in swelling and dull pain on the medial side of y knee. I need a brace that I can weightlift with, run on the treadmill and bike with. I was using the Knee-o-traker from Coraflex but it constantly needs to be adjusted because it does not stay put. Would you recommend the tru-pull lite or the advanced system and why? The DonJoy Tru-Pull Advanced System would be a great fit your diagnosis, the Tur-Pull Lite will not provide the support you need for your tracking issue. The DonJoy Tru-Pull Advanced as the option of aluminum hinges, which will be ideal when lifting and running it will provide support and control of the knee. Also the pull device on the patella will help normalize the tracking, and the Velcro straps will keep it in place and prevent it from moving. I am recovering from a left knee open MPFL reconstruction with hamstring graft, lateral release and arthoscopy. I have an athletic build with muscular thighs and have trouble with knee brace sizing. Knee braces with adjustable velcro straps have always fit me properly, as oppose to slide on knee braces with adjustable straps. The post-op knee brace I'm currently using slides on with some difficulty and gets too tight as the day goes on, due to inflammation and swelling, causing more pain in and around my patella and even feels like its cutting the circulation off in the thigh area. I guess, what I really want to know is, does this brace slide on? Should I size up and just tighten the straps? Or should I look for a brace that doesn't slide on? I am replacing a well worn DonJoy of this style for a right knee(hinged), however, I am confused about the Rt open pop and Rt closed pop options. Would you mind explaining them so I can place the correct order? Thanks! I ordered a small cause I measured 17 on the thigh. Should I have gotten a medium or a small will be okay? Hi. I am a 23 year old male and I've my knee cap dislocated 4-5 time since it first happened when I was 16. Every time it happens when I play soccer, last time being around 6 months ago. I'm still playing pickup games, once a week on average, but I'm not and won't be doing it professionally. However, I do wanna play pickup games and maybe some lower level competitive leageus, so I wanted to know which brace would be the better choice, the TRU-PULL ADVANCED SYSTEM, or the Lateral J Patella? I would only be using for soccer, since that's when I can feel my knee being weak and sometimes getting close to dislocation, but I have no problems running, walking, swimming and so on. The Tru-Pull Advanced system is a more supportive brace and should be the choice for someone who has chronic dislocations. I have a dislocated patslla from an old basketball injury, and I currently have the TRU pull lite, and with the gym activities that I do, it just doesn't seem to be doing the job I would like it to. Do you think this one would be a better match? Hi, my daughter age 16 is a basketball player and has dislocated her knee twice. Once without a brace and once while wearing the the Don Joy TRU pull Lite. I'm looking for a brace that will give her better support and allow her to play without as much movement restrictions as possible . What brace would you suggest? and with or without hinges? The Tru-Pull Advanced System is the most supportive brace for patella dislocation. It is a more supportive version of the Tru-Pull Lite. The brace is longer and has a longer lever arm on pulling the patella into the correct spot. Hello, I am an avid tennis player. I dislocated my right knee about 3 weeks ago. Unfortunately I was not wearing a brace that evening, resulting in a trip to the ER. I have worn one in the past, I believe it was the Lateral J Patella knee brace and that worked well. I was now looking at the Tru-Pull advanced system and considering it. What is the difference between the "open" or "closed" pop? Does that refer to the front? Also, would you recommend the hinge vs non-hinge? Thanks in advance. The ope vs. closed pop refers to an opening in the back of the knee. Some people have issues with the material in the back of the knee so we offer a opening to the material will not bunch up. If you want general support then you can get the hinges they can be removed if needed. I am looking to start snow skiing again and I am concerned with lateral movement in both of my knees. 15 years ago my Left knee was hyper extended (dirt bike) then soon after I stepped down from a ladder and my lower leg buckled to the left at about a 60 degree angle. My right knee did about the same prior (dirt bike), Dr. did not recommend surgery either time. Seemed to heel ok, no pain now but still a little unstable once in a while. What brace would be best to prevent lateral movement and keep both of my knees from buckling again? The hinges provide medial and lateral support to the knee. hi i have dislocated my knee twice and im looking for a brace that will give me support and will be able to play hockey with. what brace would you suggest and with or without hinges? The Tru-Pull Advanced would be the correct brace for you. The brace will aid in keeping the kneecap tracking in the correct position and help prevent dislocation. Yes this brace will keep the kneecap tracking in the correct position. You can get the brace with or without hinges for stabilization of the knee. HI My problem is an old injury that came back to haunt me. 11 yrs ago i hyperextended my knee and then wore a brace for a few months and did exercise and I have been ok since then. I recently rehyperextended it and now I dislocate lateraly every time I straighten the knee with weight on it. Do you think this is the right brace for me? can you lock the hinges at a slight angle to prevent full extention? This brace would help to keep the kneecap form dislocating but the hinge cannot be adjusted to limit knee extension. What does the Hinge Lt or Rt closed/open pop mean for ordering the brace? I am confused with both because I just need the brace with neither one of those options but it doesn't allow me to select more than one choice. What do I do? and what do they mean? You will need to choose which leg you need the brace for. I am a runner and have been wearing an open pop, hinged version for about a year and it works great; however, I am now training for a marathon and my long runs are up to three hours or so. The back of the brace has always dug into my skin which has been annoying, but now wearing it so far it is becoming very painful. Any suggestions or anything I can wear under the brace to prevent this? I have had lateral release on both knees (one last summer, one 2 weeks ago). I have a lot less pain and no more bone on bone of patella against femur. However, I have "significant arthritis" in both knees and some instability. The doctor says I will likely never be able to do squats or lunges again. So far, he is right, I experience extreme pain when trying to squat or do a wall slide. That is not acceptable to me.I am wondering if the Tru Pull Advanced brace will allow me to do these things again. I used to be a bodybuilder and am desperate to get my legs back in shape and be strong again.I have been looking at some of your other braces as well and want to make sure I get the best one for my situation. I will be working out in compression tights once I have completely recovered from this surgery so that will act as my knee sleeve. Thank you in advance. Medium or large? Calf 14 1/4. Knee cap 16. Thigh 18 1/4. What would be the best knee patella brace for football? I have had dislocations in both knees. I'm wanting to play football but afraid without the best brace I may have a dislocation. The Tru Pull Advanced System would be the best most supportive patellofemoral brace we have for someone who dislocates the patella. The brace has a inner buttress then also has the tru-pull attachment to give more support than any other braces. I have a 14 yo son that has torn his MPFL. He can't have surgery yet. His ACL and MCL are intact. I am a therapist by trade , so I have personally been in charge of his rehab. He is ready for sports now. He wore the tru- pull lite during training. But was wandering if the advanced system would be better. I was wandering your thoughts. Also can I remove the hinges if I order the brace with them. Depending on his sport and need for the hinge?? The Tru Pull Advanced should offer more support than the Tru Pull Lite. The hinged version has re-movable hinges. The brace comes with two buttresses and the elastomeric strap to anchor the brace. Knee is shot but MTB'n has saved it for me...however, every time my wheels leave the ground or I have to unexpectedly put down my left foot Im expecting a 'POP'. Im looking for protection that wont interfere with 2+ hr rides sometimes in hot temps. I dislocated my patella for the first time a couple weeks ago. The brace the orthopedist gave me is quite uncomfortable and slips down my leg after just a few steps and bunches up behind my knee, restricting range of motion . Being as the brace is hinged, I would like to stick with a hinged with the option to remove the hinge as I build the muscle back up. I'm considering the Tru-pull lite and Tru-pull advanced. Which would you recommend? The Tru-Pull Lite might be the better choice as you can remove the hinges in the brace and it is a lighter material in the back of the knee so no bunching up. I just had lateral release surgery and suffer from patella problems. I am high allergic to neoprene, does this brace contain Neoprene? The brace is made of a mesh material and it also has our Drytex material which is not neoprene but looks similar. My 10 year old son has an acl tear in his left knee that occurred playing flag football. He did PT and now reinjured it again 3 months later jumping off a 3 foot ledge as his knee buckled. I am leaning towards an advanced brace vs the light. His thighs are large for his age at 16" , center is 12.5" and calf is 11.25"...advanced small? My daughter has gone through 3 braces over the past 6 months. We have to keep buying new ones because the the top part of the hinge breaks through the material covering it and digs into her leg. What can we do to prevent this from happening and having to buy a new brace every couple of months? I'm a soccer player and two years ago I had a patella liberation surgery on my left knee. My knee got re-injured and now I have patella tracking problems. Apparently my kneecap has a wide range of movement and it tends to "pop-out" to the left. Which knee brace do you recommend the most: the DonJoy Tru-Pull Advanced, or the DonJoy Tru-Pull Lite?? Thank you for your question. The Tru-Pull Advanced System will give more support to the knee. With you activity level and severity of injury the Tur-Pull Advanced System would be a good option for you. I have had three lateral subluxations in my right knee. I rebounded from the first two well but the last one has been tough. My kneecap is unstable and my knee quickly loses mobility after exercise. I need knee stability to run and perform plyometric exercises. Should I go with the True Pull Lite or Advanced? and need a brace to help support my right knee while I rehab. my left knee. Is this a good brace for someone who has a very unstable knee? Good afternoon! I had surgery about 15 years ago to repair a torn patella tendon and the MFPL. I recently had hip surgery, and found out I am pregnant, and my knee has loosened up significantly as a result. My kneecap is tracking incorrectly, pulling laterally, and recently subluxed again. I'm not doing anything terribly athletic currently, but for daily use, combined with elliptical use and frequent walks, my physical therapist recommended I use a brace. Complicating matters, I have severe hypermobility syndrome. I don't want to overdo it and get more brace than I need, but I do want to be protected. What do you recommend? I think the Tru-pull light would be a good place for you to start. I currently have a DonJoy knee brace, and it is several years old. I don't know the exact model, but it looks very much like the Tru-Pull model. My current brace has a Velcro horseshoe shaped pad on the inside that helps keep my knee in place as well. Does this model have that, or is there another brace that I need to look at. Thank You for your question. The DonJoy Tru-Pull Advanced System has a buttress that is removable, however it only lines up against the side of the knee. It does not have a horseshoe to it. A brace that has the adjustable horseshoe-buttress would be the ProCare Patella Stabilizer w/ buttress. I have dislocated my left knee about several times and recently had lateral release surgery to help pull the knee cap back in line due it locking up and being out of place. They gave me a J brace made by BioMed but I really can't stand it. It ripped at the seem & the hinges are really uncomfortable. I am trying to decide between the Tru Pull Advance or the J Lateral Brace. I have to have hinges but because I will most likely have to wear it daily for a long time I wondering which will be the most comfortable and most supportive option for me. I need to make sure my knee cap is completely supported and protected from sliding out. Can you offer advice on which brace to purchase? Thank you for your question. Both of these braces will be perfect options for your situation. The hinged Lateral J come in a Drytex option that is a very breathable material (unlike neoprene) and the Tru-Pull Advanced also comes in a breathable fabric and has the ability to adjust the pull. If you have any further questions please feel free to call us. I have laterally dislocated both my patellas over 15 times. I have just had surgery to stabilize my patella. I am deciding whether to but the true pull lite or advanced. Am I correct in saying the advanced would provide slightly more support. And is it suitable to wear during sports. My daughter suffers from recurrent subluxations of both knees, she is 13. She has used the Tru-Pull lite in the past, but her knees subluxed while wearing the brace several times. We switched to a different brand of brace and now she seems to be having problems with those too. We thought the problem with the Tru-pull lite was that it gets stretched out or maybe was just too big to begin with even though we got the smallest size. She does competitive cheer so we are trying to find something to help prevent these occurences. She thinks that she can get the brace on tight to start but after bending her knee too many times it loosens up and the buttress isn't really supporting her knee anymore. I wondered if this advanced brace would provide her better support. Any advice or suggestions? Thank you for contacting product support. The Tru-Pull Advanced System is our most ultimate support for knees with a dislocating patella, so this might be the most logical step if the Tru-Pull Lite is not working. Recently I have been diagnosed with a bipartite patella and a slight chondromalacia of that patella on my left knee. Surgery is not an option for the moment (thing becomes painful only due to some serious activity) I am looking for a brace that would support the patella in order to prevent pain during such acitivities (especially skiing). The ACL and MCL in my troubled knee are quite healthy and I have never had a patella dislocation, but I can't really find a brace that was designed specifically for such problem as patella bipartite. Will a Tru-Pull advanced brace be suitable and effective for such purpose? Hi, I've had my MPFL (on the left knee) torn and reconstructed after multiple knee cap dislocations but this year it tore again completely. I'll have a new MPFL surgery next year but I want to snowboard this winter with my MPFL torn. Doctor said it might be possible with an appropriate brace. Could you please tell me if you would recommend me Tru Pull advanced brace or a different Don Joy brace? And also, for snowboarding - should it be open or closed in the back of the knee? The Tru-Pull Advanced would be a good brace for you. I would recommend talking with your doctor to get his approval that it is the "appropriate brace". I have used this brace for about 10 years, but I have a couple new questions since my kneecap has started dislocating again with the brace ON (pattellar subluxation on right knee). 1. Last year I reordered the brace to replace the one I had 10 years ago that was falling apart, and it has a different type of pad inside. The shape of the new pad is a large "C" fully touching my knee from top, outer-side, to bottom. The old brace used to have a smaller cressent-shaped pad - not a full C, and only applied pressure to the outside part of my knee - where I need the most support. The old version also came with 2 thicknesses of this pad. Is there any way i can order the smaller cressent pad? or perhaps even a thicker version of the new larger C pad (and then I could cut it down to the size I like)? I could not find any of these pads in the "accesseories" pages of this site. 2. Since my knee is dislocating with the brace on, perhaps I need the brace with the hinge. Is there a way I can tell if my brace has the hinge? Is the hinge internal or external? I cannot remember what I ordered. Also, do you have a photo of the brace with the hinge? I assume the photo on this page is for the non-hinge version. Thank you for your email. We are happy to hear after 10 years of use you are considering another one of our products. The Ttru-Pull Advanced System comes with 2 buttresses a1/4" and 3/8". These are available to buy direct. A product specialist can help you by calling us at 800.553.6019. This brace comes with several options, one of which is hinges. The hinges are located on the lateral and medial sides of the knee. We use Aluminum Polycentric Hinge Technology for additional medial/lateral support and control of knee flexion and extension. The picture on the site shows the hinged brace. The hinges are located on each side of the knee under the fabric with our logo. I have dislocated both my patellas on multiple occasions. I am an avid snowboarder who has been wearing the the tru pull lite for 2 seasons now. Since wearing this brace I have not had a dislocation. However sometimes I still do feel my patella shift. How much more support would this brace provide? The buttress in the Advanced System is much larger. It comes in a "C" shape covering the superior and inferior aspects of the patella as well as the medial side. The Lite has more a crescent shape providing most of its support along the medial aspect. Also because the brace is longer in size, that will also add support to supporting structures. The Advanced system also comes with the options of hinges and a popliteal cutout. My son a slight knee subluxation where he has some discomfort around the meniscus. He plays high school football and cannot have any metal showing. What do you recommend ?? The hinge in the Tru-Pull Advanced is covered it would not show. This would keep his knee cap in line and take stress off of his meniscus. The Tru-pull is a Patella Knee Brace, do you have a Patella Injury? I recommend the Tru-pull Lite for patella suport against dislocation. It measures 9" in length and great for athletics. If other Knee Ligaments are involved with offer Braces for those injuries as well. Dr just put me in a Donjoy TruBrace for patella sublux(right kbee). I am in the pool quite a bit both teaching and swimming. Can I wear this brace in the pool and immediately wash afterwards or will the chlorine break down the materials? Thanks so much for your help. We recommend rinsing the brace with water after exiting the pool or ocean. You may handwash the brace and air dry. I recommend the Tru-Pull Lite. It is a short 9" brace that provides the most support to the knee cap. There is an adjustable buttress that comes with the brace. what is the weight of this brace? Is it heavy and cumbersome to slow down in basketball? This is a soft goods brace, it's made of neoprene/lycra/mesh material. It's extremely light weight, and would be appropriate to wear during any athletic activity. I had a total knee replacement of the left knee. I am 6 months in and today we found out that my knee cap is off to the side (towards the outside of the knee) It is painful when I bend the knee and put weight on it. Will this brace help realign my knee cap along with therapy of course? Yes the Tru Pull Advanced will support your Patella, if you are interested in a smaller version, we have the Tru-Pull Lite. Its 9" in length the shortest brace we have available for Patella Instability. I am 28 and dislocated my right knee for the first time 12 years ago. After the first time I was on crutches for weeks. I dislocated it many more times after and could easily walk straight after. It dislocates to the outside of my leg. Two weeks ago I dislocated it again for the first time in 6 years and I am on crutches again this time. I really need to try something new to stop it happening. Which brace would you recommend? I prefer the tru-pull lite based on it being more compact but I just want to do whatever will work. If you have further questions, please feel free to contact a product specialist at 888-405-3251. Is this brace a good brace to wear while i am playing basketball? or is there not a certain brace for athletics? Yes this brace is appropriate to wear during basketball. However, you did not mention what type of knee injury you have. This brace is specifically designed for people who have dislocated or subluxed their patella or have patellar tracking issues. If you suffer from this type of injury, then this is the appropriate brace for you. hi, i dislocated my kneecap <a href="http://www.betterbraces.com/surfing">surfing</a>. I am going to do the PT and training to get additional strength in my supporting muscles but for a while i want to try using a brace to be safe. Will this brace work well for surfing? can i use in salt water and just hand wash after? i looked at the recommended braces for surfing and they seemed pretty weak...thanks for your time! The DonJoy Tru-Pull Advanced System or the DonJoy Tru-Pull Lite are appropriate for your injury and can be worn while surfing. The Tru-Pull Lite is a lower profile brace. If you do wear the products in the ocean make sure to rinse them with fresh water after every use and air dry. My son is 16 and <a href="http://www.betterbraces.com/baseball-and-softball">baseball</a> pitcher. He has a dislocated patella with mpfl tear. he is in rehab know. When he is ready to start pitching again will this be a good brace from him. He has also had a miniscus tear with a acl strech injury about 6 months ago. For his condition and athletic activity we would recommend the TruPull Lite, Reaction or a Rigid Knee Ligament brace with the Tru Pull Advanced Attachment also known as the TPAA. Hi, my so has had a patella dislocation on his left knee. I have read the questions above and understand more. His knee dislocates to the left during golf, so I assume the left leg brace will pull (hold the knee) to the right? Please confirm. Yes, if your son's knee dislocates to the left you would order the left leg brace. The Tru-pull Advanced System is a great choice. It is the brace I would recommend for your patellas. This brace is going to give you the support and protection for your knees while allowing you to be functional and active. I am looking at the DonJoy True-Pull brace for my son. He is 14 and very athletic. He has been wrestling competively since he was 6. He has had several patellar dislocations and I need to decide if this is the most appropriate brace for this type of competition. I realize that the hinges provide additional support, however he can not have "metal" hinges; can you describe the hinges? Also, can you order with a closed buttress over the knee cap? Any suggestions are truely appreciated. The DonJoy Tru-Pull Advanced System can be ordered without hinges as an option, however the patella opening is standard on all DonJoy Tru-Pull Advanced Systems. If you'd like to have more questions regarding the hinges, please give us a call at 800-553-6019 and we'll be happy to assist you. I was looking at the true pull advanced brace, and I was wondering where I need the hiinges. I have purchased a donjoy brace vefore that had hinges in it, but I dont remember what we put down when we bought it. I have PFD in my left knee, so I need a hinge for what side of the knee? Left or right? The Tru Pull Advanced has hinges on both sides. You'll just need to indicate right or left leg. I have had dislocations of both knees about 4 times each, all from playing sports. When my patella dislocates it stays out until I or a doctor put it back in place. This season I will be snowboarding and would like to upgrade my current knee brace to a DonJoy Tru-Pull Advanced System or similar. Do you recommend this brace and if so what is "closed pop/ open pop" also "Lt/Rt", and hinge vs. no hinge? I really want to choose the best option for my left knee. Thank you in advance. The open pop would be an opening behind the knee, and closed would have no opening behind the knee, and if you need extra stability in your knee you would choose hinges, otherwise go with the sleeve. LT and RT are left and right leg braces. 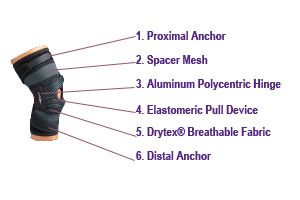 If you already use a rigid DonJoy brace ( EX: DonJoy Armor Knee Brace) for protection, you can simply buy the DonJoy Tru-Pull Advanced Attachment and add it onto the brace. I would like to order one Donjoy Tru-Pull Advanced System for my daughter. Her Patella normally slides to left so I believe 'Lt Closed Pop' would be the style. But I don't know the difference between with and without Hinge option. Waiting for your opinion and suggestion. The Hinges will add stability to the knee as well as assist in controlling the patella motion. If you are concerned about instability, choose the style with hinges. Can the DonJoy Tru-Pull Advanced knee brace be washed or laundered? We recommend washing by hand in cool water with a mild soap and lay flat to dry. Do not put in the washer. What are the pros AND cons of a closed and open pop? I've not had much experience either way - so how do I choose? The popliteal is the area in the back of the knee where your knee bends. 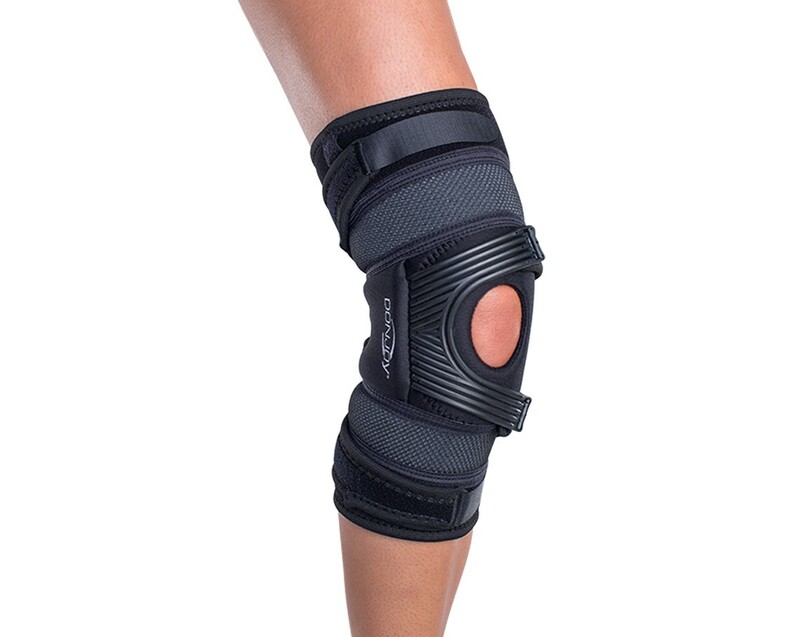 When a knee brace has an opening it is described as an "Open Popliteal" knee brace. An open popliteal knee brace is tends to be more comfortable than other knee braces that are closed in the back. There is less pinching of the material when your knee is bent. They are also a bit cooler as more skin is exposed. Some people prefer a closed popliteal knee brace because they have a bit more compression and are bit more restrictive offering a bit more support. Not happy with the workmanship. This brace is a necessity for my child to play sports, however we have to buy new ones every couple of months due to the metal support rod ripping through the stitching. The last one ripped through, dug into my child's skin, and has left a scar on her leg. We had this issue many times before, but were told we only had a very short period of time to send the ripped one back and receive an new one as a replacement. My son wore the brace in 6 football games along with daily practices and it held up while protecting the knee cap from dislocating again. I had to take the buttress out because it made the brace extremely uncomfortable. Without that, the brace works pretty well. I haven't done any strenuous exercising in it, but feel confident that I could. Liked the quality of the product and seems to be helping. I got this with high hopes of it helping my extreme patella femoral pain in my right knee and in hopes that it would give me tons of support to get through 2 surgeries to correct my left knee. I've had to bear all my weight on my right knee and really wanted to feel security in being able to do this. Unfortunately my next surgery is in 1 month for my left knee and even though it has supported me a little bit, my docs don't seem to think it's been enough. I am now headed in for an mri of the right knee because they think it's injured from all the weight bearing I have done on it. I don't know how I am going to get through surgery 2 for my left knee when I can't be comfortable bearing all my weight on the right. I was really hoping this brace would be the solution.